Alberta weather is unlike any other weather in the world. Winter can be long, cold and unpredictable, especially in Calgary and Edmonton. Yardworx has been operating in Alberta for more than 25 years, no one understands Alberta winter like we do. This winter, let our Yardworx professionals take care of your snow removal tasks. At Yardworx, we offer both residential and commercial services. 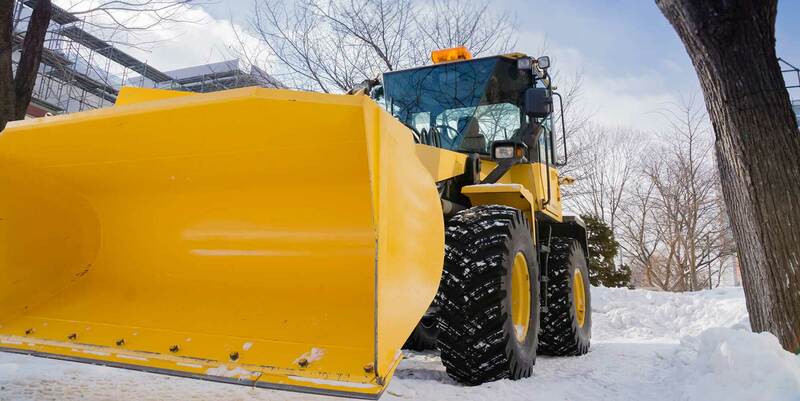 This includes snow shovelling, sidewalk snow and ice removal, ice chipping and melting, snow plowing, snow hauling, and heavy equipment services. We offer our customers in the Calgary and Edmonton area a flat monthly rate for both residential and commercial winter services. Residential snow removal monthly plan entails clearing the front walk and the walk to the front door. Commercial snow removal monthly plan includes unlimited sidewalk clearing. Our crew will visit your property 24 hours after every snowfall. Parking lot services are also available for commercial properties. We offer plow and bobcat services, or larger equipment depending on the size of the lot. Ice melt services are not included in our monthly plan for both commercial and residential customers. About one pound of ice removal clears about 30-40 feet of sidewalk. This service costs $2 per pound as well as $62.50 per worker per hour. Gravel and snow hauling services are also not included in the monthly plan for commercial customers. Any additional plows over the first two in the month are not part of the monthly commercial plan. We offer a very simple and fair pricing system that many customers love. To request an estimate or order a service, please fill out our online form or call our office today at (403) 520-5000. If you wish to add any additional areas, driveway, corner lot, oversized lot, back area and deck/patio snow clearing are offered at an additional cost. Your rate will be determined based on your property’s square footage and high traffic area will be taken into account. Our crew can come out more than once per day. If a client needs more than one service per day, the additional visits are $62.50/hour with a minimum of one hour per visit. We usually set clients up on a 2-plow container system, which means they pay the “per time” plot rate twice per month whether it snows or not. This covers the first two snowfalls. Additional snowfall services cost $200 per visit. Snow hauling is charged hourly at $350 per hour. This includes the bobcat and one dump truck. Additional bobcats/dump trucks are prorated at $160.00 per piece per hour. We offer gravel and sanding services, as these are critical during the cold winter months. It is highly recommended to gravel your parking lots after EACH plow service as the plow and bobcats make the lots very icy. All gravel services are charged at a per time price, and no retainers apply. All in snow removal commercial pricing includes sidewalk clearing, unlimited snow plowing, and unlimited gravelling. Ice melt and snow hauling is additional. One time sidewalk clearing is offered to both commercial and residential customers. The charges are $62.50 per hour. Ice melt is additional. Professional and Experienced – We’ll bring the right tools for the job, every time, for maximum efficiency and minimum environmental impact. Available 24/7 – Customers have 24/7 access to our crew through an online booking system, making us very reliable when extreme weather strikes. Stress-free Services – All of our contractors are ASCA certified, making them very knowledgeable and trustworthy. Complying with City’s Bylaws – Our services will provide your property with an easy and safe access for residents, employees or customers that comply with the City of Calgary or Edmonton’s bylaws. Emergency Responses – We offer emergency responses after a snowstorm. This means that your property is quickly and diligently managed to prevent any accidents or catastrophes. Many residential and commercial customers trust us in times of harsh winter weather. Contact Yardworx for winter snow removal services in Calgary and Edmonton today! What is my monthly rate for snow removal? The minimum charge is $159.50 and includes the front city walk and the walk to the front door. Additional charges apply for areas such as driveways, patios or decks or if the house sits on a corner lot. The cost will depend on how many additional areas the customer is looking to have cleared. Do I have to sign up for Ice Melt? No, you do not have to sign up for Ice Melt however, Yardworx does not hold any liability including but not limited to incidents such as slips or falls on your property. Yes, we offer 5% discount for seniors and a 5% to 10% discount if both you and your neighbor sign up.